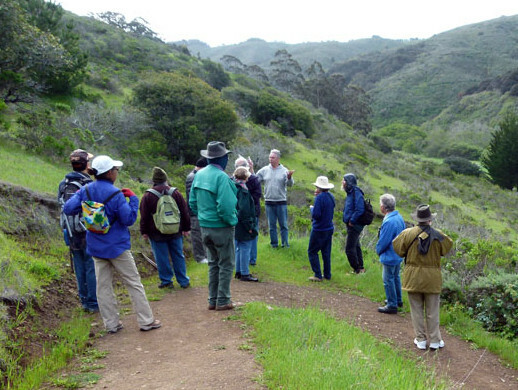 From eucalyptus forest to dense coastal shrub, San Pedro Valley Park hosts a range of habitats and biodiversity to explore. Flowers, bobcats, butterflies and more. Learn about the plants and animals that call San Pedro Valley Park home. Whether you want an easy stroll or a trek to the peak of Montara Mountain, San Pedro Valley Park has trails for every outing. Silk Tassels (Garrya elliptica). Male and female flowers grow on separate plants (dioecious). Lovely pollen laden male anthers on the male tassel above (Hazelnut Trail) Photo by Bing Huey.